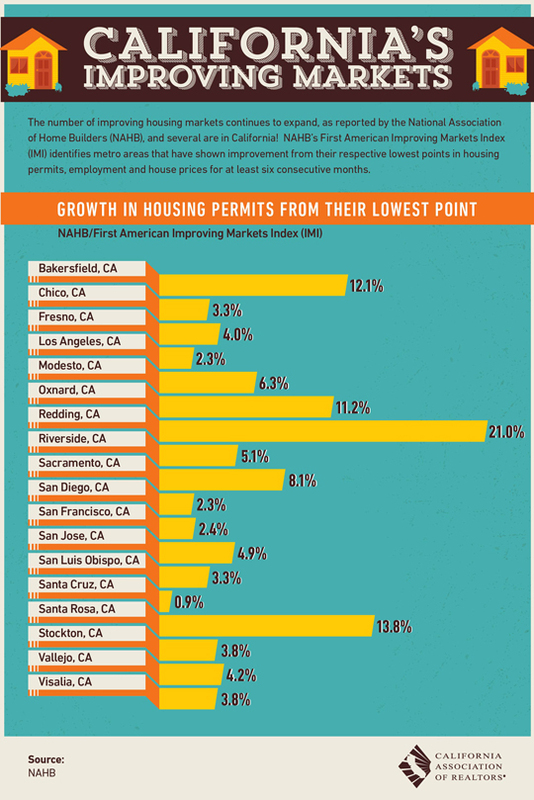 The number of improving housing markets continues to expand, as reported by the National Association of Home Builders (NAHD) and several are in California! NAHB’s First American Improving Markets Index (IMI) identifies metro areas that have shown improvement from their respective lowest points in housing permits, employment, and housing prices for at least six consecutive months. Thinking about buying? Sign up to receive email notifications as new properties come on the market. It’s fast, easy, and free! Curious about your home’s value? Fill out the Seller’s Questionnaire to receive a no-obligation analysis of your property’s current market value.